Mount Pleasant Granary - Friday 24th. October, 2014 – A short entry for a long day! Rachel with the dogs – Rachel is hanging on to them both to prevent them wandering out of shot. Doesn't the boat look spacious? Up before five and on the road soon afterwards, travelling south to Barnoldswick. I was driving, Rachel was sleeping (as was Rowan). Mix was noisily trying to reorganise his cage at the back of the car for almost the entire journey. We made good time, well we were very early – but then we hit all of the road works around Newcastle and I hate to think what it would have been like had there been much more traffic. 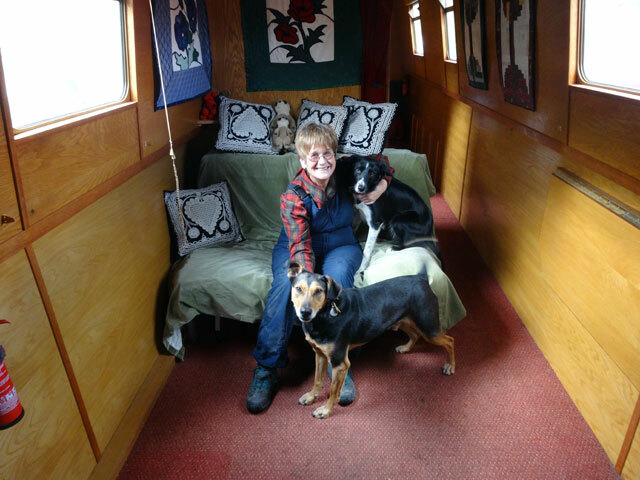 Down at the boat we met up with Olive and Digger who had had a good time exploring Barnoldswick, Skipton, Harrogate and Bolton Abbey (where they met the bodger). They had also enjoyed eating out at The Bull and at The Anchor Inn. After they set off for home, Rachel closed down the boat while I sorted the toilets (the things that have to be done on boats)! I saw Wayne and paid our next year’s subscription. This will be year five and it is still the same price as the year we arrived – but then everything about Lower Park Marina is good value, and the people are all lovely. We set off for home just after twelve and, because of our experience this morning, we drove back on the west coast returning via Langholm, Hawick and Kelso. We were still home by four (and before Olive and Digger who had stopped to explore Morpeth). We all dined in the farmhouse on a Chinese take-away to save anyone having to cook and soon afterwards I retired to bed – I’m going to watch Lewis on television (but I may well fall asleep before it is half-way through). Now I just have to walk Mix first.